Rhythm Room, a historic jazz speakeasy from the 1920s located in the basement of DTLA’s Hayward Hotel, has been restored and reopened. New owners Cindy La and Vincent Vongkavivathanakul have preserved the original checkered floors and marble stairway and dance floor, adding vintage midcentury décor and a plethora of games, including pool and ping pong. Look for espresso drinks, cocktails, beers on tap and some wines; a bar menu with the likes of gourmet hot dogs and mac n’ cheese will debut later in the summer, along with expanded daytime hours. Drinks nightly. Rhythm Room, 206 W. 6th St., Los Angeles, CA 90014, no phone. The tallest open-air rooftop bar in America has opened at the new InterContinental Los Angeles Downtown hotel in the Wilshire Grand building. Spire 73 perches atop (yes, you guessed it) the hotel’s 73rd story, 1,100 feet above street level. Look for fire pits, cabanas and a long bar, surrounded by glass walls. To drink there are luxe craft cocktails, international beers, and a generous whiskey selection; nosh on duck ham Monte Cristo sandwiches, roasted bone marrow, diver scallops or Ossetra caviar. Share tableside s’mores or chocolate fondue for dessert. Dress code is business casual. Dinner Nightly. Spire 73, InterContinental Los Angeles Downtown Hotel, 900 Wilshire Blvd., Los Angeles, CA 90017, 213-688-7777. A new location of Northern Cafe has opened on Beverly Boulevard. Expect authentic northern-style handmade dumplings (juicy pork, fish and chive) and noodles (dan dan, Zha Jiang, Shanghai fried) alongside entrées like Chongqing crispy chicken, cumin lamb and mapo tofu. To drink, choose from lemonade and Chinese and Taiwanese beer. Northern Cafe, 8459 Beverly Blvd., Los Angeles, CA 90048, 323-617-3453. Chef David Lespron and beverage director Mike Lay have debuted a glamorous tiki spot, Lono, in Hollywood. Expect an Old Hollywood vibe and iconic rum-focused tiki drinks including the mai tai, Samoan Fog-Cutter and Jungle Bird. Specialty tiki bowls for six to eight imbibers run from $120 to $450. Food items range from oxtail steamed buns and kung pao ribs to a Spam musubi bowl, Kuai fried chicken and green papaya salad. Lono, 6611 Hollywood Blvd., Hollywood, CA 90028, 323-848-4475. 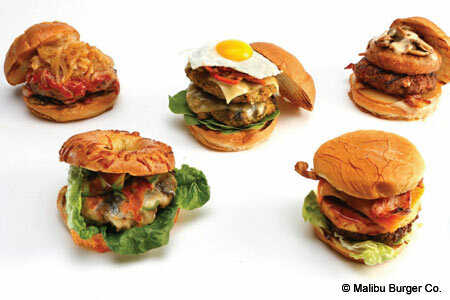 Malibu Burger Co. serves a selection of gourmet burgers and other casual fare from chef Aaron May in a creek-front setting in the heart of Malibu’s Civic Center. Malibu Burger Co., 3822 Cross Creek Rd., Malibu, CA 90265, 310-317-0153. In Culver City on Washington Boulevard, the space once home to defunct Lyfe Kitchen will soon morph into OOAK Kitchen. Expect vegetarian Chinese fusion dishes, with an emphasis on noodles and wok cooking. OOAK Kitchen, 9540 Washington Blvd., Culver City, CA 90232, no phone. The second outpost of Mark Peel’s “coastal casual” spot Prawn will land in Pasadena in summer 2017. Look for Seattle fish stew, warm albacore salad, classic clam chowder, fish and chips, and Veracruz shrimp salad, along with grain bowls and lobster rolls. To drink, expect house-made ginger lemonade and honey and mint limeade. Prawn, 16 Miller Alley, Pasadena, CA 91103, no phone. In September 2017, the owners of Tsujita will open Killer Noodle on Sawtelle Boulevard in the former Ohana Burger space. Look for spicy Chinese-style dan dan noodles. Killer Noodle, 2030 Sawtelle Blvd., Los Angeles, CA 90025, no phone. Publique will open later this year in Santa Monica’s former Border Grill space on Fourth Street, serving breakfast, lunch and dinner. The folks behind Zinqué in West Hollywood and Venice are launching the new eatery; they’ll add a large front patio, and offer a Mediterranean menu with North African dishes as well. Publique, 1445 Fourth St., Santa Monica, CA 90401, no phone. In Summer 2017, chef Jordan Kahn will open Vespertine, a fine dining destination in Culver City’s Hayden Tract across from his current breakfast/lunch spot, Destroyer. Reservations are available via Tock. Vespertine, 3599 Hayden Ave., Culver City, CA 90232, no phone. In the Fashion District in DTLA, chef Steve Samson (Sotto) has opened RossoBlù, where he features house-made salumi, Neapolitan pizzas, fresh pastas and dishes from the middle regions of Italy. RossoBlù, 9575 W. Pico Blvd., Los Angeles, CA 90035, 310-277-0210. Partners Beau Laughlin (Sawyer, Kettle Black) and Steve Edwards of Assembly Group have opened Harbor House in the lobby at the Wedbush Center, an indoor-outdoor hangout at the heart of downtown's financial district. Expect a coffee bar, grab-and-go artisanal snack shop, cocktail lounge, restaurant and a sweeping outdoor garden patio. For breakfast, find acai bowls or apricot-pistachio scones from Suzanne Goin’s Larder Baking Company, along with Stumptown Coffee, cold-pressed juices and teas. Lunch offers poached salmon salad or a buttermilk fried chicken sandwich; happy hour offers craft cocktails, a West Coast wine list and 20 beers on tap. 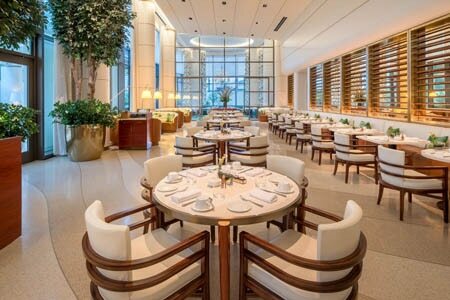 Harbor House, 1000 Wilshire Blvd., Los Angeles, CA 90017, 323-642-8393. The Mar Vista executive chefs D. Brandon Walker, Jill Davie, and Jorge Rivas have opened their second concept, The MV Grab & Go, a counter-service café across the street from the sister property. It is open seven days a week for breakfast, lunch and early dinner. Menu items include breakfast tacos, a wild salmon wrap, torn potato poutine with guajillo pork, meatloaf, turkey meatballs, salads, sandwiches and pastas. The MV Grab & Go, 12226 Venice Blvd., Los Angeles, CA 90066, no phone. Chef Ricardo Zarate (formerly of Picca and Mo Chica) is up to bat again, and opened Rosaliné in the former Comme Ca space. Expect Peruvian dishes like beef heart anticuchos, lomo saltado and arroz con pollo with huancaina feta sauce. 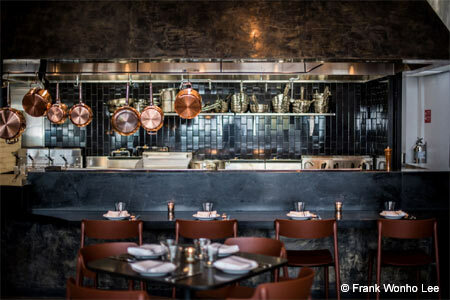 Rosaliné, 8479 Melrose Ave.
, Los Angeles, CA 90069, 323-297-9500. Silverlake Ramen is opening a takeout outpost nearby in Echo Park, also on Sunset Boulevard, called Silverlake Ramen 2 Go. Expect the same savory ramen as at the original, some limited indoor seating and delivery to one’s car in the parking lot. Honk if you’re there for an early July 2017 opening. Silverlake Ramen 2 Go, 2212 Sunset Blvd., Los Angeles, CA 90026, no phone. Chef Maycoll Calderon, of Mexico City’s Huset, will open Tintorera in Silver Lake at the end of June 2017. The leafy, sprawling former Cowboys & Turbans patio will now be home to a full bar and Calderon’s menu featuring ceviches, aguachiles, tiraditos, stews and grilled meats --- just in time for summer. Tintorera, 2815 Sunset Blvd., Los Angeles, CA 90026, no phone. Heirloom LA catering partners Matthew Poley and Tara Maxey have opened Yolk & Flour in Cypress Park. The airy restaurant (in a former theater) features a patio, lunch and dinner Monday-Friday, and a takeaway counter; the Heirloom catering business will be housed here, too. 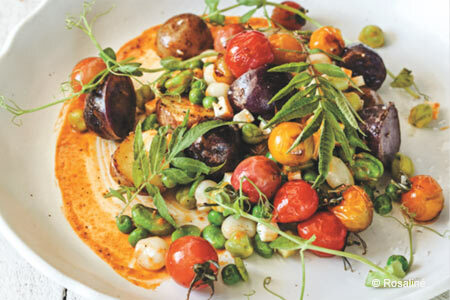 The menu is vegetable intensive, but also offers some meat dishes. Look for the famous lasagna cupcakes to take center stage, along with salads, sandwiches, pizzas, tartines and the likes of pumpkin guacamole and tuna tartare with roe caviar on a crispy saffron risotto cake. Yolk & Flour, 3232 1/2 N. Figueroa St., Los Angeles, CA 90065, no phone. Hollywood’s historic Formosa Café will re-open later this year under new ownership by the 1933 Group, lately responsible for the impressive restorations of landmarks Highland Park Bowl and Idle Hour. The Formosa dates back to 1925, and was a favorite of Marilyn Monroe and many other stars. Look for a modern cocktail program and likely a return to nostalgic Asian eats. Formosa Cafe, 7156 Santa Monica Blvd., West Hollywood, CA 90046, no phone. Chef Dave Beran, former executive chef at Grant Achatz's Next restaurant in Chicago, is striking out on his own on the West Coast. 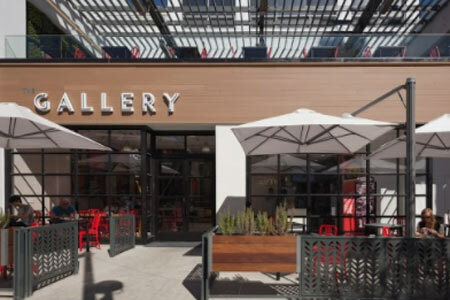 His restaurant, Dialogue, will offer an intimate tasting menu experience at The Gallery, the newly renovated food hall on Santa Monica's Third Street Promenade. Look for a Summer 2017 opening. Dialogue, 1315 Third Street Promenade, Santa Monica, CA 90401, no phone. Hotelier Juan Torre teamed up with chef Paco Parreño of Delicat restaurant in Valencia, Spain, to bring the concept to Los Angeles. Delicat serves dinner at the Tuck Hotel in downtown’s Fashion District. Expect to find some twists on familiar dishes among the tapas and entrées, as in the burrata ice cream and lime air accompanying marinated tomatoes and guacamole in the “Just a Tomato Salad.” Delicat, 820 S. Spring St., Los Angeles, CA 90014, 213-947-3815. Chef Mark Peel (Campanile) flipped his Grand Central Market spot Bombo into a fast-casual seafood concept called Prawn. Look for seafood stews and chowders, fish and chips, warm albacore salad and lobster rolls, as well as grain bowls topped with daily seafood. Peel plans to multiply the eatery, following up the downtown location with one in Pasadena in late summer. Prawn, Grand Central Market, 317 S. Broadway, Los Angeles, CA 90013, No phone. Coly Den Haan (The Must, Perch) has opened Hot Hot Food on Hoover Street in the newest hipster Silver Lake/Virgil Village hotspot. (It’s near Sqirl, need we say more?) Eastsiders will like the comfortable booths, kitsch 70s art, jukebox and patio, and the mashup menu focusing on “LA fried rice” fusions. Look for fried rice plates with the likes of braised pork carnitas or jackfruit; candied and smoked bacon bits with coffee salt and eggs; and purple and green kale with mushrooms. Salads, chili, burgers, and avocado toast all day are available, too. To drink, find gourmet milkshakes, coffee and fresh juices. Breakfast, Lunch & Dinner daily. Hot Hot Food, 654 N. Hoover St., Los Angeles, CA 90004, 323-522-6927 . Highland Park cult pastry fave Mr. Holmes Bakehouse has opened a location in Larchmont. Look for the “cruffin” craze to continue here – but be warned, they sell out quickly and there could be long lines. Cruffin flavors include peanut butter chocolate cream and cherry almond. Donuts come filled with cherry curd and blackberry thyme jam, and there are matcha and churro croissants, too, such as the signature California croissant, a savory version with smoked salmon, nori and wasabi. Breakfast & Lunch daily. Mr. Holmes Bakehouse, 248 N. Larchmont Blvd., Los Angeles, CA 90004, 323-230-6675. Shin-Sen-Gumi 2GO is a new Japanese restaurant with a unique drive-through option. Breakfast features a spam and egg rice burger, and you can grab a deluxe bento box for lunch for under $10. Look for a variety of ramen, musubi and gyoza, and for dessert, coffee jelly with fresh cream. Breakfast, Lunch & Dinner daily. Shin-Sen-Gumi 2GO, 18203 S. Western Ave., Gardena, CA 90248, 310-324-3246. Italian newcomer Giulia has opened at 7th and Hope in DTLA. Look for cicchetto like bone marrow with citrus marmalade, wild sea scallops and grilled octopus; pasta includes short rib manicotti and langoustine linguine; mains feature osso buco, chicken al mattone and Gorgonzola rib-eye. There’s also gourmet pizza, brunch and a late-night menu. Giulia, 701 W. 7th St., Los Angeles, CA 90017, 213-279-5025. French chef Jean-Georges Vongerichten has opened his first California restaurant, Jean-Georges Beverly Hills, at the new Waldorf Astoria Beverly Hills. 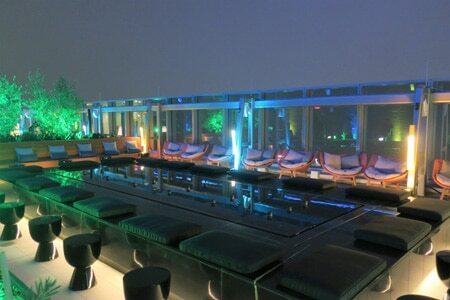 Vongerichten also oversees The Rooftop by JG, a more casual restaurant/bar situated alongside the rooftop pool. Watch GAYOT's exclusive interview with Jean-Georges Vongerichten and hotel owner Beny Alagem. 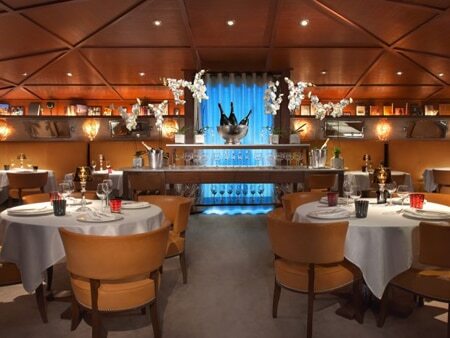 Jean-Georges Beverly Hills, Waldorf Astoria Beverly Hills, 9850 Wilshire Blvd., Beverly Hills, CA 90210, 310-860-6666. As of August 6, 2017, Burbank’s hilltop steakhouse restaurant The Castaway will close for renovations for six months. Look for refreshed banquet rooms and a new, expanded patio offering a view when it reopens next year. Lunch Mon.-Fri., Dinner nightly, Brunch Sat.-Sun.. The Castaway, 1250 E. Harvard Rd., Burbank, CA 91501, 818-848-6691. House of AN hospitality group has announced big changes on the horizon for Crustacean, their Beverly Hills restaurant that has been serving Asian fusion fare for two decades. The restaurant is undergoing renovations and will transform into two different dining concepts. 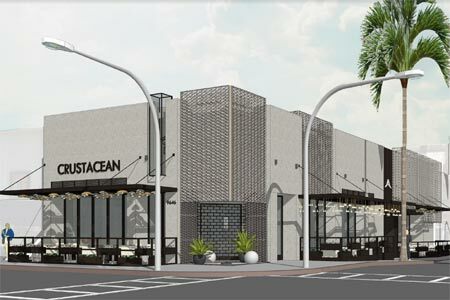 Crustacean will continue to occupy the first floor, but with a revamped menu and floorplan featuring adjustable walls for more flexibility for private parties. The space will also include a U-shaped bar, sidewalk patio and garden seating, a chef’s table and a glass-enclosed kitchen. Meanwhile, the second floor will be home to a new restaurant, whose name and menu are still under wraps. The re-opening date is scheduled for October 2017. Crustacean, 9646 S. Santa Monica Blvd., Beverly Hills, CA 90210, 310-205-8990. During the month of June, Plan Check Kitchen + Bar (Sawtelle Boulevard, Fairfax Avenue, Wilshire Boulevard, Ocean Avenue) partners with attitude-fueled vegans Michelle Davis and Matt Holloway of Thug Kitchen to offer a limited-run Plan Check x Thug Kitchen Takeover Menu ($3-$15) featuring plant-based twists on the restaurant’s classics. A portion of the proceeds will be donated to the West Hollywood Food Coalition. Menu highlights include the Lazy Hunt Burger (kidney beans, smoked almonds and umeboshi paste seasoned patty topped with lettuce, caramelized onions and avocado); Popcorn Cauliflower (breaded with fried chicken-inspired spices and baked to a crisp); and a special cocktail, Fool’s Gold (mezcal, pineapple purée, orange blossom simple syrup, lime juice and mint). SAAM at The Bazaar by José Andrés in the SLS Hotel Beverly Hills closed following service on July 29, 2017, and will be replaced by a new restaurant called Somni, a joint concept with chef Aitor Zabala (an elBulli alum). No word on the menu yet, but expect the kind of avant-garde haute cuisine for which Andrés is known. SAAM at The Bazaar by José Andrés, SLS Hotel Beverly Hills, 465 S. La Cienega Blvd., Los Angeles, CA 90048, 310-246-5545. Berlin Currywurst in Silver Lake has closed, though its DTLA Grand Central Market location remains open. Chef Darren Sayphraraj’s Smorgasburg hit We Have Noodles will move into the location later this summer. Berlin Currywurst, 3827 W. Sunset Blvd., Los Angeles, CA 90026, no phone. Brentwood's Early World coffee shop will close this summer. Early World, 11938 San Vicente Blvd., Los Angeles, CA 90049, 310-826-3246. Chef Sevan Abdessian's gastropub 51 Tavern (formerly Recess Eatery) in Highland Park has closed. 51 Tavern, 5022 York Blvd., Highland Park, CA 90042, no phone. Malibu Farm Pier Café at the end of the Malibu Pier is temporarily closed for renovations. In the meantime, guests can still visit Malibu Farm Restaurant & Bar at the beginning of the pier. Malibu Farm Pier Café, Malibu Pier, 23000 Pacific Coast Hwy., Malibu, CA 90265, 310-456-1112. Chef Vic Casanova’s Italian steakhouse, Pistola, has closed. Casanova has moved his pasta restaurant Gusto into the West Third Street space. Pistola, 8022 W. Third St., Los Angeles, CA 90048, no phone. Peruvian restaurant Picca shuttered after service on June 4, 2017. Picca, 9575 W. Pico Blvd., Los Angeles, CA 90035, no phone.